Several years ago, Don Burke befriended an Amish family in the Jamesport, Missouri Amish community. 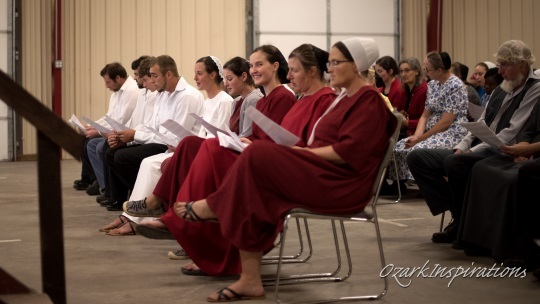 Earlier this year, one of the daughters, raised Amish but not a member of the Amish church, asked Don to take the photos of her upcoming wedding. 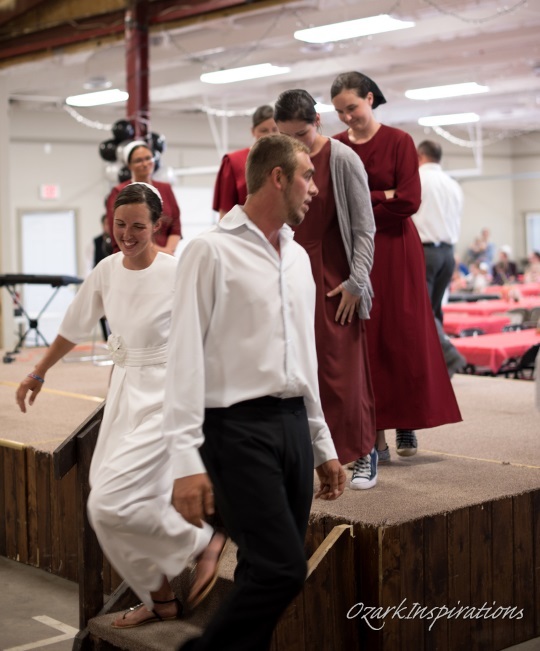 In the first part of Don’s photo set, we saw the pre-ceremony gathering, which included guests from Amish, Mennonite, and English backgrounds. Today, we have photos from the wedding ceremony itself – along with 2 videos of songs sung at the service. I’ll let Don take it from here. As described in part 1, this wedding reflected the mixture of traditions that were a part of their personal and family journeys. And that mixture was evident in the wedding ceremony, too. The wedding began with the bride and groom and the rest of the wedding party entering into the community center, and taking their place in the front row. The second was “Praise Song” (or “Lob Lied,” but sung in English). This song is traditionally the second song that the Amish sing (in German) during their Sunday worship service. 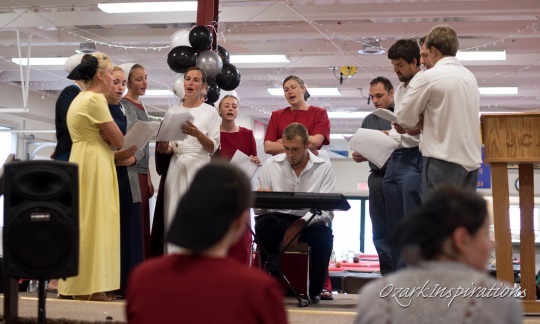 Following the congregational songs, the youth group sang “Go Rest High on That Mountain” (accompanied by the groom on an electric keyboard) in memory of the late brother of the bride, and dear friend to most of the rest. The bridal party then stepped up on stage. 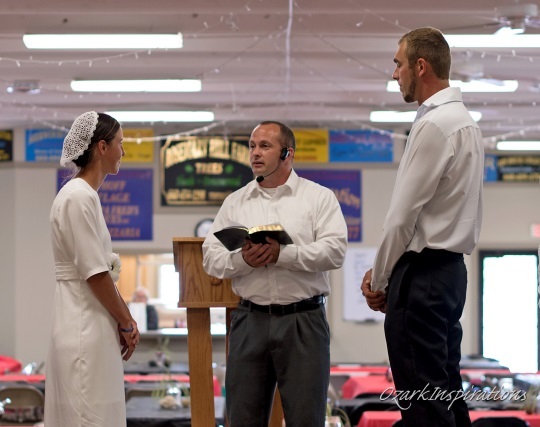 The ceremony was officiated by an English pastor and included elements that would be fitting in most English weddings. 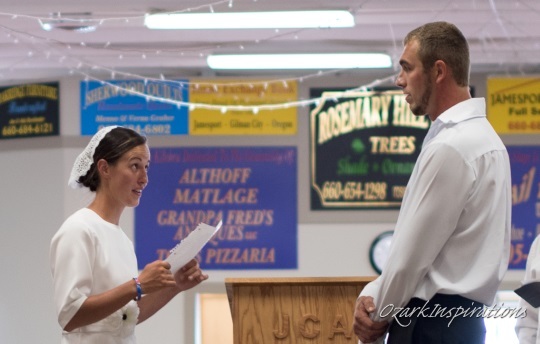 …and the exchanging of rings. 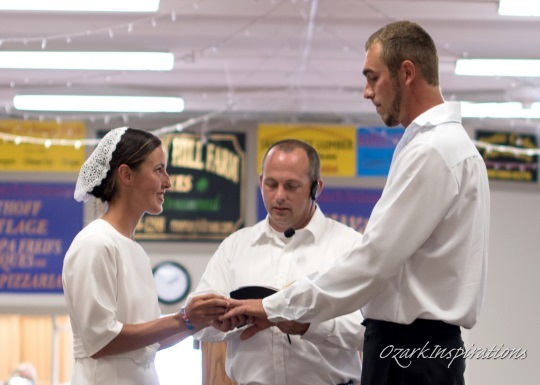 After a prayer offered by an Amish minister, we were introduced to the newly wedded “Mr. and Mrs.,” and the wedding party left the stage as the ceremony ended. Stay tuned for part 3, on the reception. And check out more of Don’s photos at his PlainSong Facebook page. Thanks Don for sharing these wonderful pictures. I guess since they exchanged rings the bride and groom do not plan on joining the church. 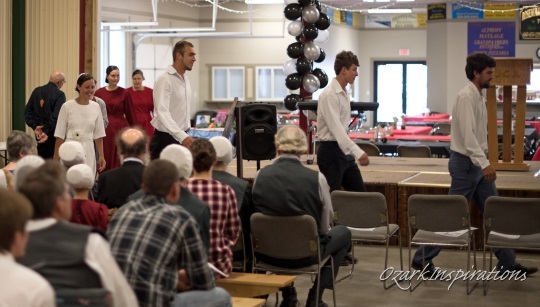 I can’t remember from the first post but is the groom an English or Mennonite? This was a truly unique ceremony and reminded me somewhat of my own wedding in a Unitarian church some 43 years ago. 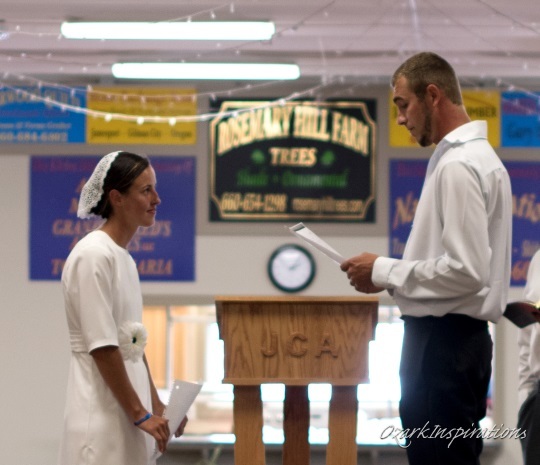 I appreciate the couple (any marrying couple) crafting their own vows and service in general. After all, they are the ones marrying one another. The minister or judge or priest merely adds the “so be it/Amen” that makes it “official” to man, to society. The song dedicated to the bride’s late brother brought a tear to my eye. I found it very moving. How have they fared since their wedding? I hope they’re thriving. Hey ladies. Glad you enjoyed the pictures. Sorry I’m a bit slow in responding — I was on the road returning from an out-of-state family Thanksgiving, and wasn’t able to see the post until just now. Debbie, the groom is not English. Like the bride, he grew up Amish and also went through the transition that many in the area did in the past few years (as described in the first article posted earlier). At the time of the wedding I’m not sure if he/they considered themselves New Order Amish, Mennonite, or just somewhere in transition. Alice Mary, yes, the tribute to the late brother of the bride (plus her maids and one of the groomsmen) was very touching. In the half-year since the wedding I have not yet had the opportunity to return to see them face-to-face, but do correspond with them regularly. As far as I know they are doing well. Great pictures Don…thanks for sharing. In Lancaster, PA, all the Amish friends I know wear a heart-shaped bonnet and I always assumed that the type in your pictures were worn by the Mennonites…at least in Lancaster. Guess it depends on the area, or maybe I made a wrong assumption. And Erik….you thanked us for our support, but you are the one that we are all so thankful. Thanks for all you have done and for all we have learned though these many years. Happy New Year everyone.